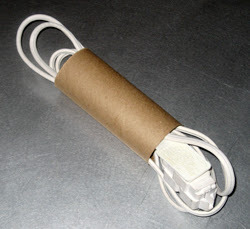 Many products are valued for their versatility of use - and this one ain't that. 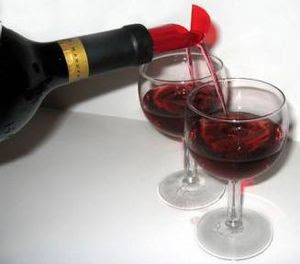 This double wine pourer has exactly one purpose, to pour two (identical) glasses at the same time. From a usability standpoint, this borders on ridiculous - the time saved is on the order of a few seconds, and not in a time-critical situation. It's not applicable in any other situation, at all. However, in that one case for which it's perfect, its use adds a little something - a "cool factor" (or maybe "tool factor," but who's counting). There's something about having exactly the right thing for a niche situation, and being able to use it, that's undeniably satisfying for the user and anyone watching. It's that feeling of everything just falling right into place. And then it can go back into hiding, waiting for the next time, if ever, when that perfect situation will come up again! With a plethora of products out there designed to allow multitasking, at some point we users may have to draw our own line between efficiency and safety, rather than having it drawn for us. Here's one that may be right on that line - "Bikefast," the breakfast bike tray by Philipp Drexler. For the frequent urban bike commuter, this may be a great way to make the most of otherwise wasted time while stopped at intersections. But how do you resist the temptation to finagle a bite or a sip while in motion? What might happen to the food, the bike, or its rider, and is it worth the risk? Designs that enable bad "side" behaviors, even while providing good and valuable "main" functions, may be overall bad designs. Users just can't always be trusted to look out for their own best interests! A concept from designers Pu Tai, Ayda Anlagan, and Paul Blease on Yanko Design, the Pock-it is a variation on the ubiquitous Post-its legendary for their versatile usability. 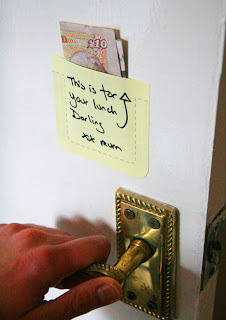 Appropriately, this addresses one of the few functions that Post-its were never good at: holding something else up. The danger of original Post-its is that a user could imagine that they'd be able to perform this function, and may actually attempt it, but they just can't be trusted that way. Who knows how many fallen Post-its-plus-cargo have gone "missing" on the floor? 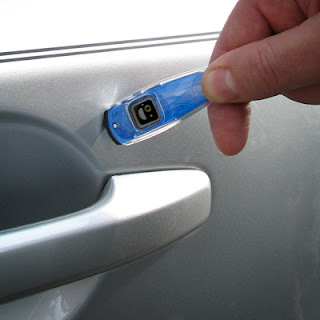 And as a solution, Pock-its are designed well - dimensioned to hold business cards, credit cards, gift cards, or currency, and printed with an outline of the adhesive areas for orientation and an instant understanding of the function. The adhesive even stops short of the top, so an edge can be easily peeled from a pad of these things. 3M, are you listening...? Netflix Mailers - Usability, good looks, or machinability? 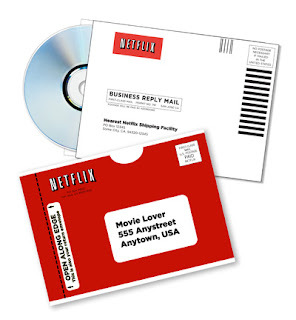 The AP reports that Netflix's DVD-mailing envelopes design has been causing problems for the U.S. Postal Service; specifically, that "non-machinable" aspects of the mailers have resulted in the frequent need to manually handle them at a much higher cost. That's the kind of cost that comes back to the consumer eventually, either through Netflix fees or postage rates. So this design seems to need to find a sweet spot, in between high usability, good looks, and machinability. They're already very usable - the same envelope is used to mail movies out and back, with peel-off adhesive and tear-off conversion. And the current look of the mailers is very much part of their branding, saturated red with white and black accents. I don't know what needs to change to make them more machinable, but here's hoping it's a mere aesthetic change - or that the usability will be impacted little if any. In any case, this example demonstrates how products often have to deal with other factors outside of the frequent areas of aesthetics and usability - and how usability might easily be drowned out by the others if it doesn't have a good advocate on the case! Lifehacker reports that MaqQuest has added a gas price calculator to its mapping site. It's interesting that this feature seems to have been missing from mapping sites - routes can be adjusted, traffic severity and patterns can be included, and time estimates are accurate down to the minute, but gas cost hasn't been an available (or at least not a prominent) metric. After all, the monetary cost of a trip may influence a user's calculation about whether to take the trip at all - if the choice is to drive farther to find a better price on a purchase, for example, this may help the user discover that the nearer, higher price is actually a lower total cost. Or even make the purchase online, eliminating another car on the road and reducing the carbon footprint of the purchase. Not bad, for just a little more info made available to users! It's winter, and static electricity is all over the place. For lots of us, there are times and places where we know that a nasty little shock is waiting for us - that one door handle, car door, desk chair, or mailbox, that just always gets ya. And when that's the case, you dread it - it's just a little shock, but you can't bring yourself to just reach out and touch it. We'd all be better off if we didn't have to play mind games with inanimate objects and the laws of physics. Enter the Static Electricity Eliminator, which does exactly what you'd think. It fits on a keychain, so users can have it when they need it; the tip is rubber, so it won't scratch whatever you're grounding; and it even gives you positive feedback when you've grounded yourself (read: when you've dodged a shock). If that doesn't give you a good feeling, I don't know what will! 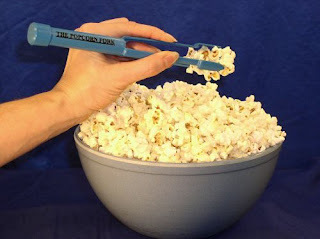 Popcorn Forks - Useful? Ridiculous? Can't decide. Designers or not, we all end up designing "products" that will be used by other people. Outgoing voicemail messages are a perfect example; are we thinking of the "user" (the caller) when we decide what to say? In most cases, no - we just repeat the same litany of time-wasting, useless info we're used to hearing when we get other peoples' outgoing messages. The Cranking Widgets Blog has come up with some instructions for how to make your outgoing message more user-friendly - things like "don't tell me to leave a message," "don't tell me you're unavailable," and "don't tell me you'll return my call as soon as you can," all of which are obvious if a message is being recorded in the first place. Also on the list: do say if you'll be gone for a predetermined time; don't tell me to email you (the caller is probably phoning rather than emailing on purpose! ); and of course, "Don't. Play. Music." Overall I'm a fan of these guidelines. But there's one exception - if a normal outgoing message is full of useless time-wasting information, that time can be used by the callers to mentally compose their messages. Which may mean more efficient, coherent messages left on your machine... which may be more user-friendly to you! 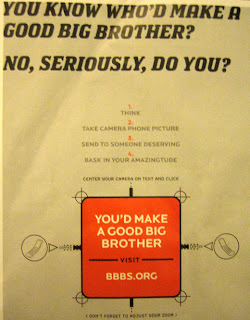 This is a photo of an ad I encountered in the print edition of Newsweek recently, where the reader is encouraged to recruit good volunteers for Big Brothers / Big Sisters by (1) taking a cameraphone photo of the orange square on the page, and (2) sending that image to a friend who'd fit the role well. Besides rating high on the "cute" factor (note the aiming aids to the left and right of the target area, and the reminder to adjust your zoom), this is actually an ingenious usability idea by the advertiser. Most magazine ads require a reader to cross platforms - that is, they have to remember (or clip) something from the printed magazine, and then either make a phone call or look up a website. This design enables the reader to leap nimbly from the magazine to the sent photo message, without having to remember anything, or even cobble together a unique message to the friend. That lowered barrier could definitely make a difference in the number of people who go through with the whole routine! The next step: smartphones which can identify the "bbbs.org" URL in the photo, and make that portion of the image a clickable link. Technology can do it, if designers can just think of it! Why let all that water just roll off the side of your umbrella and go to waste? Why not have some fun with it? Alex Woolley has figured out how to make adults play in the rain: an umbrella with a funnel-shaped top which guides water through the pole and into a water gun. 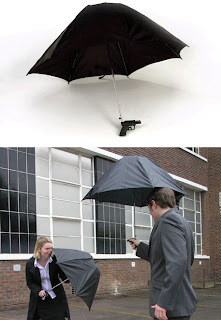 With a few good shots, your adversary may as well have never brought an umbrella in the first place! Good user-centered design puts what people need when and where they need it. Great user-centered design lets them feel good about using it. In this case, drivers (ahem, men?) who are lost and too proud to stop for directions can stop for gas and, hey, just happen to get directions! 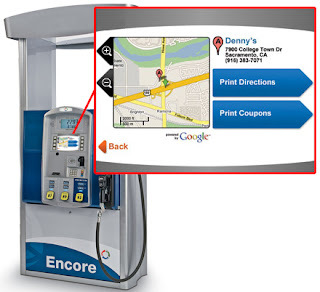 Engadget reports that Google Maps will soon be available on certain internet-enabled gas pumps - free, supported by coupons that print out along with maps and directions. It's not admitting weakness because it's part of another task. That kind of denial often is a valuable part of self-image - and one that a great design will take into account.